... their wedding took place in an after dusk ceremony in Texas on June 12, 2012. Actor, Matthew McConaughey, married longtime girlfriend Camila Alves, who he has two children over a 5 year relationtionship with. 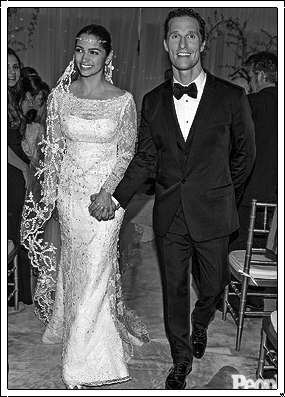 Me Alves turned to Ducarmo Castelo, a Brazilian designer, for her dream gown: a delicate beaded lace gown.